The CIS (Contact Image Sensor) method enables high-resolution scan, high-speed scan, energy saving, and light and compact design. 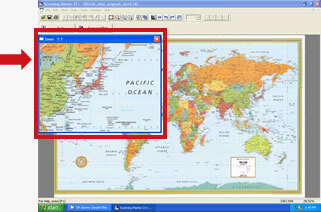 Graphtec scanners allow for “High Definition Plus” via the CIS method. All Graphtec scanners currently use the CIS sensor system, ensuring sharp, crisp and clear image reproduction. This technical advantage is further reinforced by a very accurate paper feed and hold technology. Even deep wrinkles on paper can be smoothed to provide optimal image reproduction. Graphtec scanners provide stunning high-resolution images compared to other products in the market. 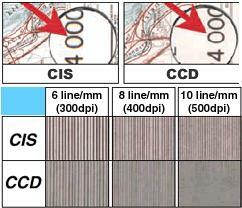 Graphtec scanners (CS610/510/CSX300) achieve a wider color gamut using the CIS method instead of the older CCD method. (CS610/510/CSX300) can produce high levels of precision and accuracy, as well as a high Optical Resolution of 600dpi. These are truly state-of-the-art scanners that not only meet the needs of industries requiring precise images such as civil engineering drawings, city planning drawings and apparel paper patterns, but also satisfy the needs of the graphic arts and printing industries. What is the CIS (Contact Image Sensor) method used in the image scanner? Image scanners can use one of two methods to scan documents—CIS or CCD. Graphtec employs the leading-edge CIS method for optical systems in its scanners. Enabling extremely high-resolution and high-accuracy input with large-format scanners, the CIS (Contact Image Sensor) method is a state-of-the-art scanning technology that uses contact image sensors developed solely by Graphtec. 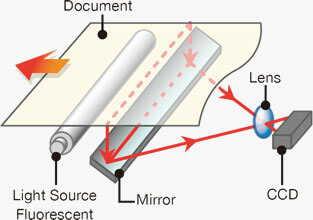 Light from the light source is reflected by the document’s surface. This reflected light is reflected further by a mirror, directed through a lens, and received by the CCD. Since the CCD reads light reduced by the lens, this method is called the “optical reduction method”. The light from the three RGB color LEDs used as light source are reflected by the document. This reflected light is received in turn by the CIS sensor, which performs the actual scanning. The LEDs, lens, and sensor are integrated into a single module. Since these components are all rods of the same length in close contact, this method is called the “contact image sensor” method. 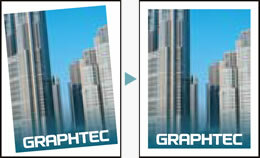 This is the method used by Graphtec. This method is ideal for markets that require precision for applications such as civil engineering survey drawings, urban planning drawings, and apparel patterns. All models provide 600dpi optical resolution and 9600 dpi interpolated resolution allowing high-resolution and high-quality scanning. Further high-resolution and high-quality scanning is enhanced by Graphtec technology that improve contact between document and sensor. The scanner is ready for scanning 10 seconds after power on *1, thus saving energy. This feature meets several environmental standards. Compact design saves space, operability and resource. 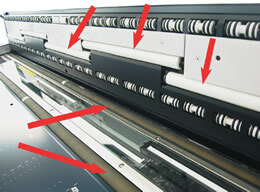 High-speed is provided with our long-established document feeding technology. CS610 Series supports the ITA (Intelligent Thickness Adjustment) feature, allowing for scanning of thick medium up to 20.3 mm (0.8 inch). To load a medium using the ITA feature while automatically detecting its thickness, first press the ITA button to activate the function. Then gently push the top edge of the medium against the top cover, which allows the cover to rise up. After loading the medium, the cover closes to place it in position. CS 610/510 and IS210 adopt a new paper pressure feeding mechanism, which helps smooth out even the badly wrinkled paper and ensure optimal image reproduction. Thick medium can be securely held to guarantee correct feeding, resulting in accurate scanning. All series now have as standard the sliding paper guides with a right-left balancing function, a very useful mechanism when loading medium, and has proved very popular among many users. *1 The maximum length of 999m can be set at the ScanningMaster21+. But actual scanning length varies depending on the specification of PC and the condition of scanned document.The scanning of the long length is out of the guarantee. Guaranteed precision conditions: Temperature 20 +/- 3 °C ; Humidity 60% +/- 10% R.H. The Scanning Master 21+ software for scanners provides a wide range of features, including a powerful backup solution for those using scanners. 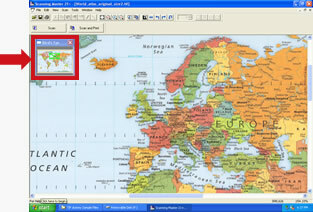 This software converts scanned data into digital data and offers simple data editing and correction functions. Specify scan settings for specific needs. Offers an integral Scan-to-Print function. After scanning the document, you can have scanned data printed automatically via the Windows driver. Skewed documents fed into the scanner are automatically deskewed for skews of up to ±7.1°. Available for grayscale, 256-bit color, and full-color data as well as bilevel data. Automatically removes speckles as the document is scanned. Any speckles below the specified pixel level are removed for monochrome data. For grayscale and color data, the software applies an averaging function to match surrounding colors. Displays the entire image in a separate window. This function lets you confirm which part of the image to display. 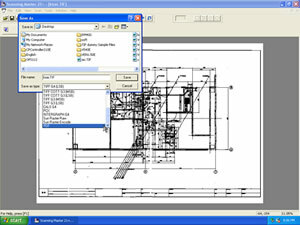 Displays a detailed drawing of the image displayed at the current cursor position in a separate window. You can set scanning conditions suitable for different document types (e.g., maps, drawings, or blueprints) in advance to enable easy selection of the most appropriate scanning environment. Moreover, these conditions can be edited and new scanning conditions added and stored. To enable scanning, you can adjust White point, Crease reduction threshold level, and Crease reduction intensity values to turn the background of the tracing paper or mylar film white. Press the scanner Scan key on the main body to enable continuous scanning. File names are automatically numbered and saved sequentially. Select the appropriate command from the File menu to save scanned data in PDF file format. 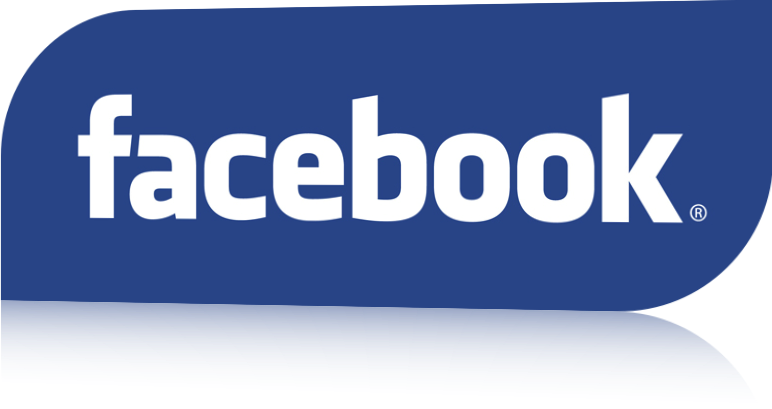 This feature enables various data management and application methods.